Armani Hotel Dubai have been awarded the title as Dubai’s Leading Hotel for the third consecutive year by the World Travel Awards. Envisioned by fashion icon Giorgio Armani, this hotel is without doubt standing out from many other hotels. The hotel occupies 11 floors of Dubai’s iconic skyscraper, Burj Khalifa, and by having its own entrance you will bare notice it is a part of a 160 floor mega structure. As soon as you enter the lobby of the Armani Hotel you will see a very modern and sleek design, all thought trough by the world-renown designer Giorgio Armani. In the lobby and throughout the rest of the hotel you will find the same minimalistic interior design all in earth tones such as rich cocoa-colored wood paneling. Every detail has been personally chosen by Armani to reflect his passion for stylish comfort and functionality. Each of the rooms and suites, which take the unique form of the tower, are finished with precious materials. The curved walls are clad in custom-created luxurious fabrics and handmade leather from Florence, floors are covered with Japanese Tatami and bathrooms feature dramatic green bamboo marble from Brazil. Each living space is furnished with bespoke Armani Casa pieces including oak tables with liquid metal finish created exclusively for the hotel. The hotel has 160 rooms and suites stretching from the base of the metal-and-glass Burj Khalifa through the eighth floor, then skips some two dozen stories before continuing on floors 38 and 39 where you will find the Armani Signature Suites. In between on floor 9 to 16 are the Armani Residences all with same interior design as the hotel itself. Armani / Lounge – The lounge is located on lobby level and is open from 8am to 2am. It is a great place to meet friends or discuss business while enjoying interpretations of international cuisine. Here, you will also find an extensive selection of coffees, teas, and wines complement a world-class array of beverages. Armani / Mediterraneo – Contemporary casual style is what defines the All Day Dining outlet at the Armani Hotel, from breakfast to late-night dining. In the mornings you will find a classic continental buffet breakfast or option for a la carte favorites. For lunch and dinner you will be able to enjoy a culinary journey across the region with selections of regional specialities. Armani / Ristorante – The essence of Italy is brought to life at the Armani/Ristorante where a natural passion for the finest ingredients, exquisite flavor combinations and contemporary presentation come together in an exclusive environment that excites the palate and leaves lovers of gourmet dining wanting more. 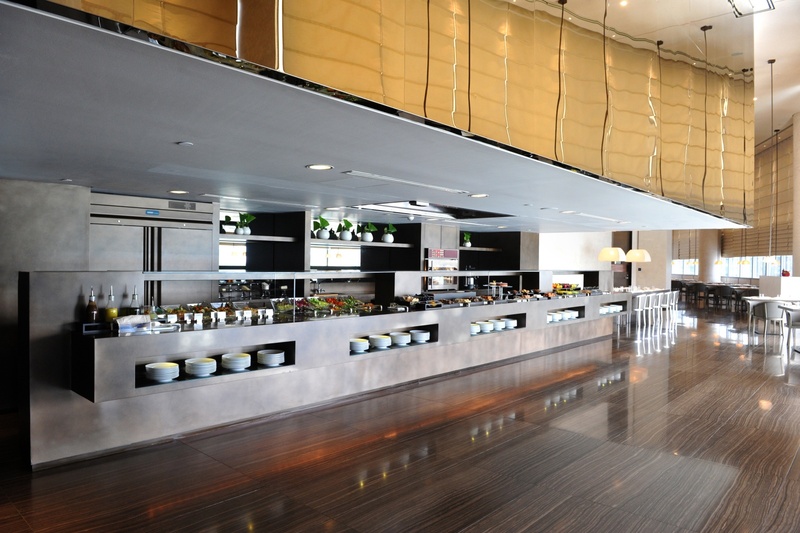 The restaurant is located at lobby level and is open from 7pm to 11pm every night. Armani / Amal – Here you will find fresh and innovative regional Indian cuisine. Exotic curries and other specialities are prepared tableside, showcasing time-honored traditional cooking methods and ingredients. The restaurant is located on the third floor where you will be able to enjoy a memorable dining experience with stunning views over the Dubai Fountain. Armani / Deli – Pick up something to go from the fresh food display, relish the simple lunch time delights of a plate of homemade pasta or join friends for a Friday brunch. From fresh bread and classic charcuterie to European cheeses and tempting pastries. Armani / Hashi – Fresh fish is flown in daily from around the world and complimented by a selection of speciality beverages. You will be able to enjoy panoramic terrace views of the Dubai Fountain while dining on sushi, sashimi and other various Japanese dishes. Armani / Prive – This VIP lounge hosts many exciting nights in Dubai. Meet up with old friends and make new ones while dancing into the early hours to the vibrant beats of the resident DJ, as well as visiting and international guest DJs. Guests can relax at the extensive Armani Spa, offering personal treatments and sequential bathing. Also, you are able to enjoy views from the outdoor swimming pool. 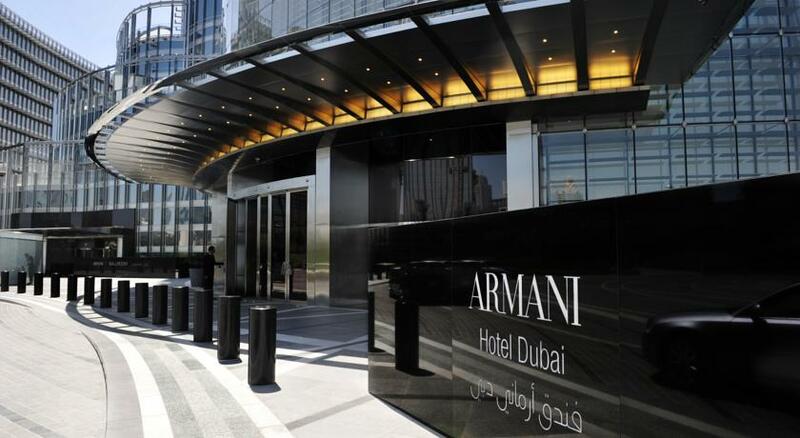 For more information or reservations, visit the Armani Hotel Dubai website.